Objectives: This tutorial was designed to introduce selected topics in stochastic models with an emphasis on biological applications. An introduction provided the basic theory of Markov chains and stochastic differential equations. Methods were presented for deriving stochastic ordinary or partial differential equations from Markov chains. Some of the relationships between the master equation in Markov chain theory and the theory of stochastic differential equations were discussed. Numerical methods for approximating solutions to Markov chains and stochastic differential equations were presented, including Gillespie's algorithm, Euler-Maruyama method, and Monte-Carlo simulations. Applications of Markov chain models and stochastic differential equations were explored in problems associated with enzyme kinetics, viral kinetics, drug pharmacokinetics, gene switching, population genetics, birth and death processes, age-structured population growth, and competition, predation, and epidemic processes. Some statistical methods were introduced, useful for data fitting and testing of stochastic models. The tutorial consisted of a series of lectures and lab sessions conducted by the organizers and guest lecturers. Lab sessions illustrated some of the applications and the numerical methods. Abstract: Some basic definitions and notation for Markov chains are introduced. Then, the state classification are presented. Finally, some limit theorems are established and the stationary distributions characterized. Abstract: Some classical biological applications of discrete-time Markov chain models and branching processes are illustrated including a random walk model, simple birth and death process, and epidemic process. Single-type and multitype branching processes are applied to cellular processes and age-structured growth. Probability of population extinction, time to extinction, and the probability distribution conditioned on nonextinction are illustrated in these examples. Abstract: Some applications of continuous-time Markov chains are illustrated including models for birth-death processes, competition, predation, and epidemics. The inter-event time and the Gillespie algorithm are defined. The relationship between discrete-time and continuous-time processes are illustrated in these examples. In addition, the probability of extinction, time to extinction, and the probability distribution conditioned on nonextinction are discussed. Abstract: A brief tutorial about maximum likelihood inference for discrete time and continuous time Markov chain models. Using a simple state-space model where all the calculations can be done by hand, the main concepts involved in parameter estimation for these models are illustrated. Then, the parameter estimation process is illustrated using computer intensive methods, such as MCMC and other, recent developments requiring efficient simulation techniques for such stochastic processes. Abstract: The definition and some basic properties of Brownian motion are introduced. Then, some properties of stochastic calculus are presented and compared to the classic calculus. Finally, the basic theory of stochastic differential equations are introduced. Abstract: A procedure is described for deriving a stochastic differential equation (SDE) from an associated discrete stochastic model. Stochastic differential equation systems are derived for several population problems. (Modeling with SDEs continues in the second lecture.) Commonly used numerical procedures are described for computationally solving systems of stochastic differential equations. Abstract: Continuing the topic of efficient simulation techniques for stochastic processes, this presentation includes a full illustration of a study case involving a birth-death process and outline current, promising research avenues involving the interaction between stochastic processes modeling and modern statistical methods for Markov chains. Abstract: A procedure is reviewed for deriving a stochastic ordinary differential equation from an associated discrete stochastic model. Stochastic ordinary differential equation systems are derived for several population problems. Equivalence of stochastic differential equation systems is explained. It is shown how stochastic partial differential equation (SPDE) models can be derived. Several examples of SPDEs are presented. Maroulas V, Xiong J. 2013. Large deviations for optimal filtering with fractional Brownian motion. Stochastic Processes and Their Applications, 123(6): 2340-2352. [Online]. Allen LJ, Bokil VA. 2012. Stochastic models for competing species with a shared pathogen. Mathematical Biosciences and Engineering, 9(3): 461-485. [Online]. Bokil VA. July 2012. Stochastic models for competing species with a shared pathogen. 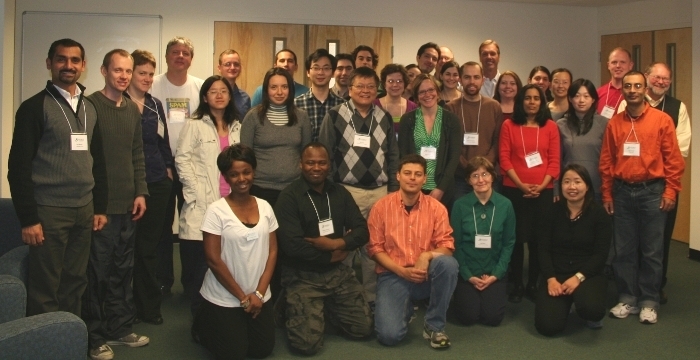 In Minisymposium: Epidemiology of Multi-host Pathogens: Math and Biology Perspectives, The Society for Mathematical Biology Annual Meeting, University of Tennessee, Knoxville, TN. Bokil VA. December 2011. Stochastic models for competing species with a shared pathogen. In: Topics in Ecological Models, International Symposium on Biomathematics and Ecology: Education and Research, University of Portland, Portland, OR.